Recently I wrote a blog about the stub article length of Wikipedia articles. I mentioned the difference in actual number of characters and number of bytes used to define stub articles between English and Indian language Wikipedias. One can open any language Wikipedia, type Special:ShortPages in the search box to get the list of articles which have less than 2048 bytes. But the as already mentioned in tht blog, the number of bytes for Indian languages to be considered as stub should be actually 2048*3 = 6144 bytes employing the same criteria. How to find the list of articles fulfilling this condition? This brings us to the topic of querying Wikipedia data. Wikimedia Foundation Labs has put up a website wherein one can run SQL queries on Wikimedia data. The URL of the website is quarry.wmflabs.org. When we open the website, we get a textbox wherein one can type the SQL query which will run on Wikimedia data. In this example I will consider Wikipedia only. But the queries can be run on the data of other Wikimedia projects like Wikisource, Wikidata, Wiktionary, etc. To begin one has to login with his/her Wikimedia login. After loging in, the SQL query can be typed in the textbox and the Submit Query button has to be clicked. 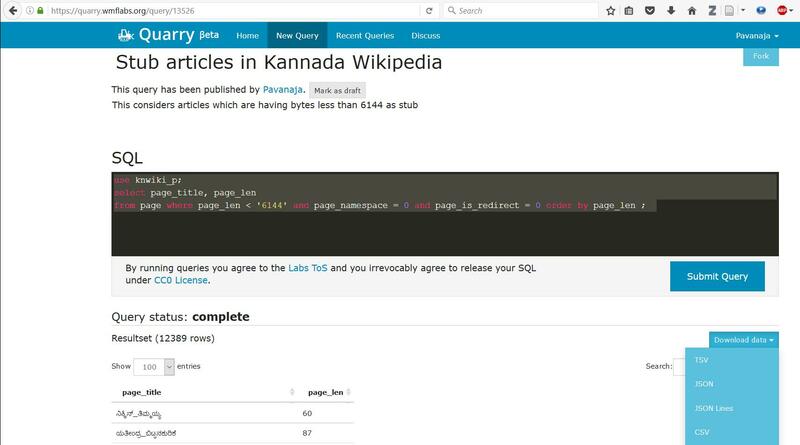 The result of execution of the query on Wikimedia data will be displayed. In this blog I will be discussion Kannada Wikipedia. The database for Kannada Wikipedia is called knwiki_p. Complete list of databases can be obtained by running the SQL query “show databases;”. To know the schema of any table, run the query desc <tablename>;. For example to know the details of the table by name page, issue the query desc page;. 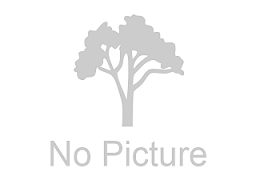 The fields which are of importance in the current case is page_title and page_len. 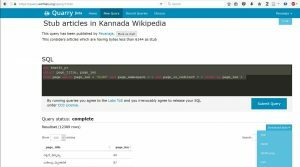 The following query will list of all articles in Kannada Wikipedia which are having less than 6144 bytes. The resultant data can be downloaded as JSON or CSV file also. How to get a list of Index pages on Wikisource by a particular User?